Chris has always been incredibly good at escaping. 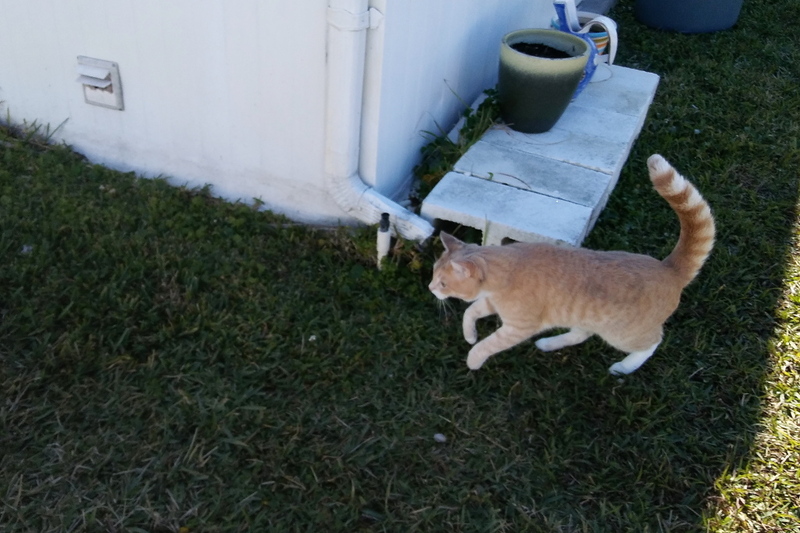 At first, it was a real problem, but it eventually became clear that he wasn’t interested in going very far so I stopped worrying when he got out. Frankie escaping, on the other hand, was more of a concern because he is a traveler and I worried that he would get lost or hit by a car or something not so good. Luckily, his escape skills were not as good as Chris’s although he still got out from time to time. Things have changed recently and Frankie is now better than Chris at busting through the door when I try to come in with groceries or other bags. There are a few reasons for that. One is that Chris has slowed down with age, he is almost 9. Also, his weight has climbed to almost 18 pounds. Frankie has aged too but he is a couple of years younger than Chris and he is still skinny. What has changed the most though is that Frankie has become smarter. He now doesn’t hesitate and sprints out the door as I swing it open and before I can put a bag down to block him. Sometimes Chris and Frankie work together so while I block one, the other gets out. If that’s not bad enough, the distraction caused by one getting out is enough to let the other one escape. Then I have two cats to retrieve. Chris stays close and eats grass or rolls around on the driveway so I don’t worry about him. Frankie will also stay close for a short time until he senses me coming and then he is off. 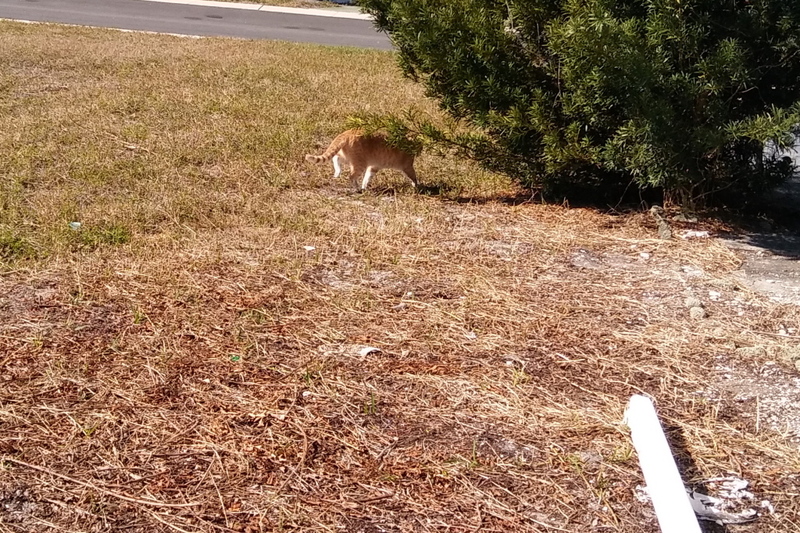 He will find a place to hide like under a car or a bush where he knows I can’t catch him. 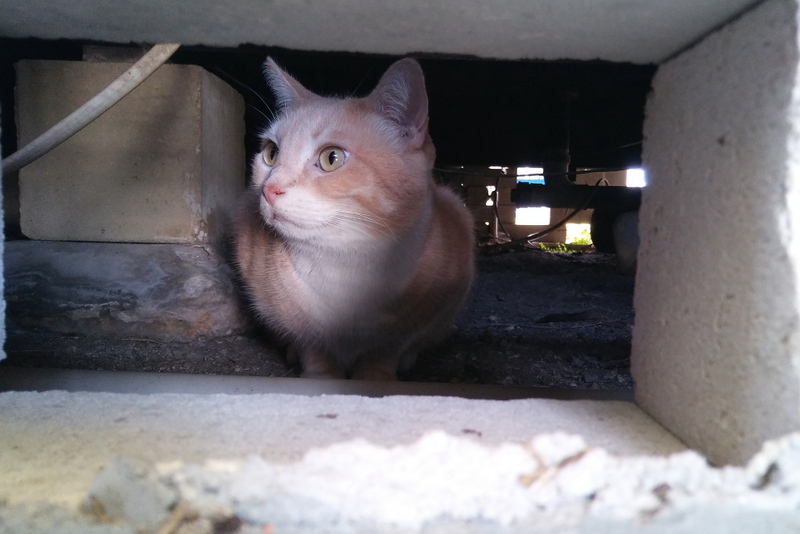 Sometimes he goes under our house or a neighbor’s house. I hate when he does that because it is impossible to coax him out and I believe it is where he sometimes picks up fleas. Also, our neighborhood has many rabbits that hide out under homes and Frankie has already shown himself to be a rabbit hunter. The good news is that Frankie knows he has a good home and he will come back if left alone. Yesterday I was at Lowes buying something for the catio we will soon have built. I called my wife to ask if she would take a picture of the outside of the home and send it to me. When she did she also texted that Frankie got out. It took me about a half hour to get home and when I did Frankie was on top of my wife’s car. When he saw my car he got very excited and was talking up a storm. I opened the door and he went right in with Chris at the door waiting for him. Rose said she forgot about him being outside. That is the dangerous thing about waiting for him to come back. We could forget he is out there. Indeed, he got out earlier that morning and I forgot he was out there. It was relatively cold so when Rose reminded me I opened the door and he was right there waiting. He escaped Tuesday morning as I was leaving for work and I didn’t even know he got out until I saw him running away after I closed the door. I could have just as easily looked the other direction and left for work with him outside. The funny thing was, he let me catch him relatively quickly but I forgot I had locked the door and my key was in the wrong pocket. As I struggled to get the key out of my pocket, Frankie jumped down and I was stuck waiting for him for fifteen minutes. At least when the screened catio is built this won’t be as much of an issue. Does ay one else struggle with pets who like to escape? 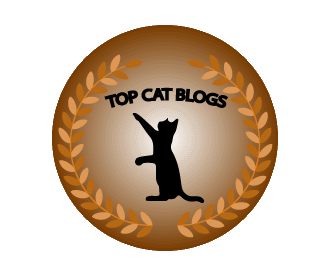 This entry was posted in Uncategorized and tagged catio, Cats, escape on February 1, 2018 by Charles Huss. wow Frankie… to be better than Chris is like a miracle… I mean he is legend….. but hey, concats!!! Well, old age catches up to the best of us. Puck and Floki don’t try to get out either. I put the harness on Puck the other day thinking he needed to get out but he freaked out so that didn’t happen. I have learned with Frankie that you can’t get a cat to do anything. You just have to wait for them to decide. Sometimes you can speed up that decision by pretending to pick them up to bring them home. Frankie is a rascal! 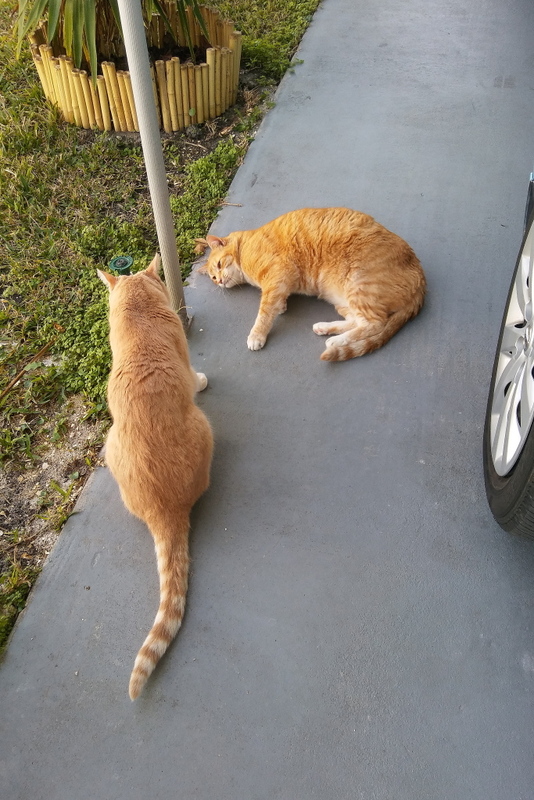 My human has a friend whose cats she feeds when occasionally when she goes out of town. She gave my human all sorts of instructions about how to get in the house without one of the cats getting out because he too is an escape artist. Fortunately so far, my human has been able to get in and out without him making any moves! It’s not easy for sitters. Frankie got out on our sitter the last time we went away. It’s good to him that buffer zone. That’s why we want to build the patio as a buffer. That Frankie is a sneaky little fellow! I’m glad that he tends to return home safely. Manna and Dexter both like to dart out the door, but they never go more than a couple of yards from the door. They just want us to chase them and bring them back in. We don’t ever leave them outside. It is way too dangerous when you live in a place that is below freezing for most of the year. I hit send too soon. Fortunately we live in Florida. That’s a little scary. Wally used to be the escape artist here…but like Chris, age and weight has slowed him down lately. I think I have said before that Wally and Chris have a lot in common. We are lucky that we have an enclosed porch so they would have to get through 2 doors. I live in Indiana and it is so cold here that the cats don’t want to go outside. They live in a barn and do go outside in warm weather. When I call they come running for treats. I think even if your cat ran off and you are mad you still have to give treats when they do what you ask. That is true. Negative reinforcement doesn’t work well with cats. The cats try to go outside, but we have the advantage of an inside porch. I can bring all the groceries in to the porch before I open the inside door. They usually get sidetracked by the stuff in the porch before I go out. It is really helpful to have that buffer zone.